Pedare Christian College values excellence and diversity and seeks to recognise this through our scholarship program. The scholarship program celebrates and fosters excellence in academic achievement and music performance, and recognises students who take responsibility for, and are proactive in, the development of their own education. Importantly, the program provides opportunities for students to attend Pedare who may not otherwise be able to do so. A limited number of Academic, Music and All-Rounder scholarships are awarded each year and are reviewed at each reporting period. Scholarships provide partial remission of tuition fees at the discretion of the Principal. For further information in relation to the College’s scholarship program, please contact the Community Relations Manager, Julie Holland at jholland@pedarecc.sa.edu.au or phone 8280 1700. 2020 ACADEMIC SCHOLARSHIPS – Registration has now CLOSED. 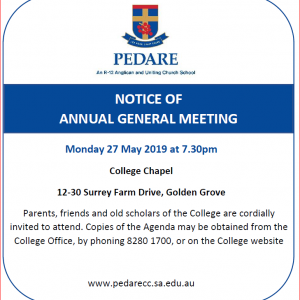 The Pedare Christian College Music Scholarship and Bursary Program recognises individual musical talent and the commitment of the College to this important area of the curriculum and the musical and worship life of the College. These scholarships and bursaries are open to instrumentalists and vocalists and will be awarded to students who display outstanding musical ability and potential and a sound academic record. The College has a strong music culture with Concert Bands, a Stage Band, Choirs for all ages and a Jazz vocal ensemble, String Ensembles, two string quartets, percussion and guitar ensembles and a biennial musical, that we will develop with successful applicants. Applications for 2020 are now open and will close on Friday 28 June, with auditions to follow.